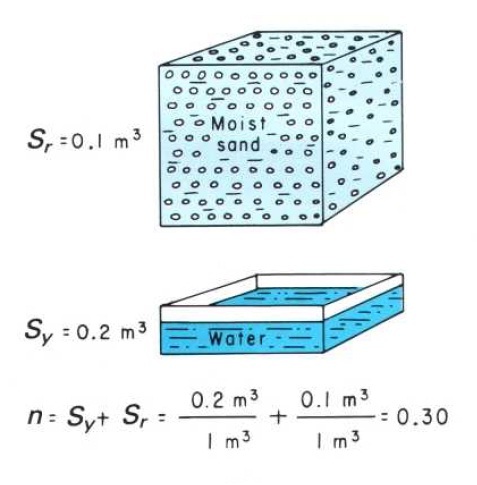 Specific yield tells how much water is available for man's, use, and specific retention tells how much water remains in the rock after it is drained by gravity. where n is porosity, Sy is specific yield, Sr is specific retention, Vd is the volume of water than drains from a total volume of Vt, Vr is the volume of water retained in a total volume of Vt, and Vt is total volume of a soil or rock sample. In unconfined aquifers, the storativity is almost exactly equal to the specific yield. The most reliable method of calculating the storage coefficient (S) and/or the specific yield (Sy) is to carry out test pumping. ACTION CONTRE LA FAIM, 2005, Water, sanitation and hygiene for populations at risk, HERMANN ÉDITEURS DES SCIENCES ET DES ARTS, P 78. Heath, Ralph C., 1983, Basic ground-water hydrology: U.S . Geological Survey Water-Supply Paper 2220, p 8-9.